Your one-stop source for glass fabrication technology. For over 25 years, EFCO Furnaces has designed and built furnaces and ovens to heat-process glass, we suppply leading glass manufacturers around the world. 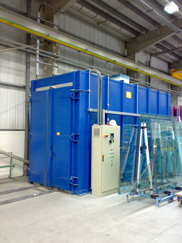 With engineering and manufacturing facilities based in the south of England, EFCO is in well situated to supply equipment to meet the increasing demands for toughened glass in architectural, domestic appliance, automotive, marine and engineering markets in Europe and the rest of the world. EFCO has a highly competent and responsive technical support team and our experienced Service Department has a proven track record of solving emergency problems, providing scheduled maintenance, and modernizing older equipment to deliver improved performance and economy. We can support virtually any make of furnace or oven with technical services and spare parts. Our goal is to enable you to increase the productivity, reliability, quality, and economy of your process heating equipment.